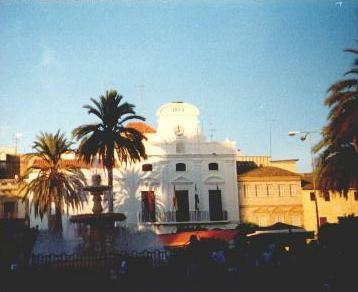 Merida is in the middle of Extramadura, Spain and consequently is the focus of tourist traffic. It is also quite a beehive of economic activity and construction that I didn't expect. 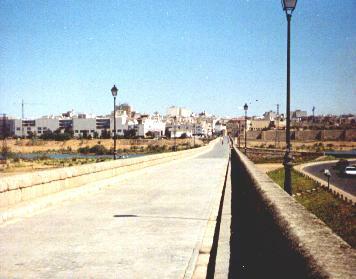 When I entered the city from the bus station I walked across this incredibly long Roman bridge like a conqueror. It is in excellent condition helped these days by a new bridge west of here that takes most of the traffic. On the right is the plaza mayor where you can sit on tables under umbrellas and somebody will be sure to come and serve you a drink to help you cope with the difficult touring work you are doing. What is fascinating about this bustling city is that as recent as the 1920's Merida had a population of about a thousand souls. 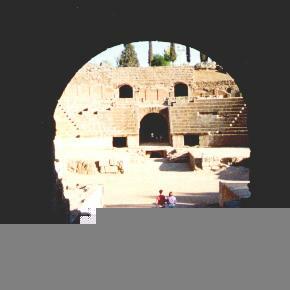 At that time, in the unexcavated pit of the colosseum (right) they kept a herd of goats. 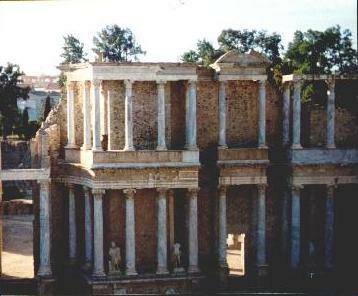 The theatre on the left has been restored to the point where they have performances there again. The picture is taken from the top of a nicely restored semicircular seating area. From the remnant marble visible that finished off the fascade I was very much impressed with how superior those Roman craftsmanship were to our immitators of today.